"Meadows's journey along the razor's edge brings refreshing clarity and enlightenment. He lets you feel, smell, taste and touch Sri Lanka in its moment of tumult. A great read for those seeking more than news reports and academic analysis. Highly recommended." — Robert Young Pelton, author of The World's Most Dangerous Places and Licensed to Kill. "Meadows' courage and the personal relationships he builds with the people he meets in Sri Lanka reveals the extent to which our fears are only a sign of how much we still need to learn. His warm approach and bridge-building provides an insight to civil strife that is unprecedented in other works. An excellent undertaking." 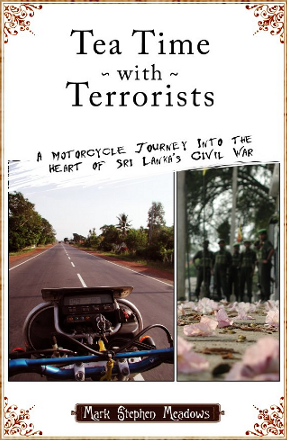 — Greg Mortenson, Author of "Three Cups Of Tea"
"Armed with a map, a motorcycle, an infectious sense of humor, and a dim understanding of Sri Lanka’s war, author, artist, and explorer Mark Stephen Meadows arrives there intending to have, as it were, afternoon tea with terrorists. Figuring that the first step to solving a problem is understanding it, he journeys north into the warzone, interviewing terrorists, generals, and heroin dealers along the way. "He discovers an island of beauty and abundance ground down by three decades of war. As he travels north through Colombo, Kandy, and the damaged city of Jaffna, Meadows gives his riveting take on the war. Known for child conscription and drawn out torture methods, he explains, the Tamil Tigers also invented suicide bombing and were the first to lace together terrorists and financiers into international networks of militant uprising. "In Sri Lanka, Meadows discovers a deep view into an ancient culture. Along the way, he learns to trap an elephant, weave rope from coconut husks, cast out devils, and he actually has tea with a few terrorists. This is the inspiring story of his journey and an enlightening meditation on the interconnectedness of globalization, the media, and modern terrorism." Photos, videos, and recordings from the journey.